One of the tasks that you might want to do with an image is to identify and annotate the objects within it. With it’s ImageSolver and AnnotateImage scripts PixInsight makes this really easy. 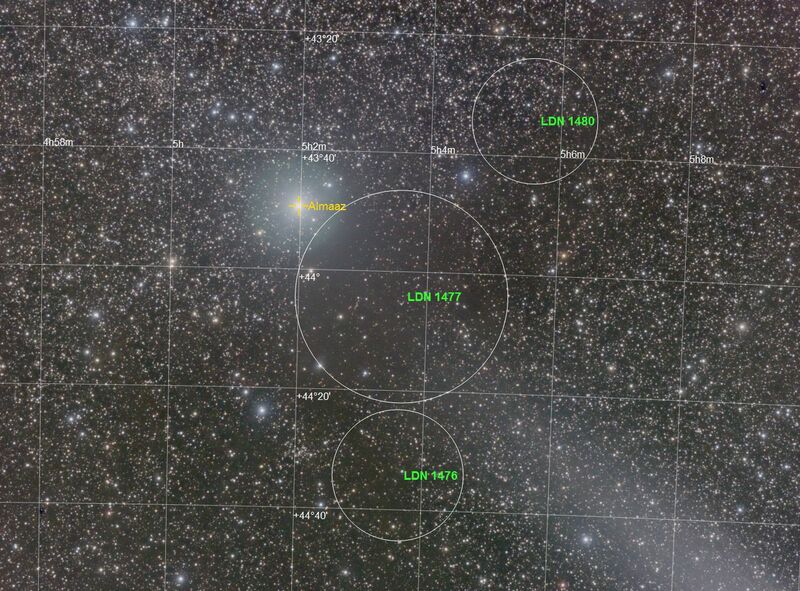 The AnnotateImage script comes with several pre-canned catalogs such as Named Stars, Messier, NGC and PGC catalogs but also gives you the ability to specify your own. What I’m going to describe here is how to generate and use your own catalog from a VizieR source. Entering the authors name (Lynds, in this example) returns a list of all matching catalogs. We need the second item in the list which has a catalog ID of VII/7A/ldn. Clicking on the title, Lynds’ Catalogue of Dark Nebulae (LDN) (Lynds 1962), takes us to the catalog selection page http://vizier.u-strasbg.fr/viz-bin/VizieR?-source=VII%2F7A. We could also search on any other identifying information or, if you’re unsure you can browse the entire collection. We’re going to use a simple constraint query to return all catalog entries but with just the selection of fields that we require. There’s a lot of flexibility here and you can filter records based upon various criteria such as object size or magnitude to limit the search but we’re going to keep it simple here. The fields we require are LDN and Area so ensure that these columns are ticked and clear all the others. 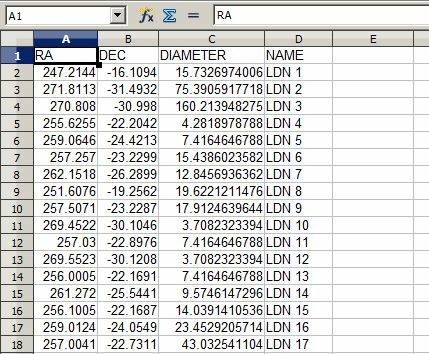 We don’t select the columns for RA and DEC as these are of the wrong epoch and also incorrectly formatted and there’s an easier way to obtain the correct information. On the left of the screen is a Preferences panel with more options; select Compute and tick the J2000 box. This will return correctly formatted, J2000 coordinates which will save us some work later. Also select ‘ascii text/plain’ from the drop down list and select Decimal for ‘Position in’. Choose a value for Max that matches what you expect in terms of the number of catalog entries. Finally, we’re ready to Submit the query and the results will be returned on the next page. Make a note of the column headers and then copy and paste all of the catalog entries into a text file on your computer. Next, fire up your favourite spreadsheet program and import the text file such that the data is divided into discreet columns and correctly aligned. I’m not going to describe exactly how to manipulate the data in your spreadsheet; just the general objectives so that the data is correctly formatted. Put these column names, as required, into the first line of the spreadsheet. Now we’re ready for PixInsight. Load your linear image and run the ImageSolver script, entering values and parameters as required in order to plate solve the image. Documentation is available either online or in the program for this and once it’s completed successfully you can progress with any image processing that’s required to form your final image. Note that, once solved, you cannot resize or resample the image so carry out these tasks first. Run the AnnotateImage script, select any of the predefined catalogs required, click the + button and add a custom catalog, supplying the path to the previously saved text file in the dialog box. You should now have a new image with all the objects identified and marked.